Some get there faster than others. There are 1,826 billionaires in the world. Becoming one is an extremely impressive feat. However, some billionaires are more impressive than the rest. Fun Fact: Rockefeller is considered the wealthiest and one of the most charitable people of all time, with an adjusted net worth of $345 billion. He founded the University of Chicago but refused to have the school named after him because he didn’t want his name to overshadow the school. How he did it: Thanks to nonexistent laws regarding monopolies, Rockefeller made a fortune by founding Standard Oil. He started Standard Oil in 1870 when he was 31-years-old in Cleveland, OH after his early career as a produce broker. Within a few years, he bought nearly every refinery in Cleveland and became one of the most powerful men in America. By the early 1890s, Standard Oil controlled 90% of oil in America, making him America’s first billionaire and one of the reasons why monopolies are now highly regulated. Fun Fact: When he was 15-years-old, Gates made $20,000 by selling a program he designed to monitor street traffic. How he did it:In 1978, three years after starting Microsoft, Gates had 25 employees and $2.5 million in revenue. By 1983, Microsoft powered 30% of the world’s computers. 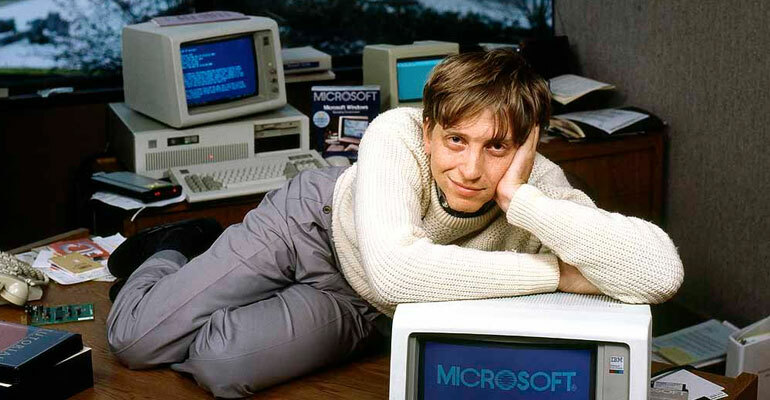 In 1986 Microsoft went public, giving Gates a net worth of $350 million. He was 30-years-old. Soon, that number increased to billions, making him the richest, gangster-est nerd in America. How they did it: Brin and Page came up with the idea of Google as part of a school project at Stanford. After building a prototype, the pair tried selling the company to web portal startup Excite for $1.6 million. Page told Excite that he’d take $600,000 in cash, $700,000 in stock, and the remaining $300,000 would be given to Stanford. Thankfully, Excite countered with $750,000 and Page declined. Brin and Page became billionaires a few years later while they were in their early 30s when Google IPO’ed. Fun Fact: Before Facebook raised funding, Parker convinced an artist to paint a mural in the first Facebook office. Instead of accepting $60,000 in cash, the artist asked for stock in Facebook. The artist, David Choe, is now worth over $200 million today because of his stock. How he did it: Prior to becoming the first president of Facebook, Parker started Napster and Plaxo. After a few years, Napster shut down and was sued for (literally) a trillion dollars and Parker was forced out of Plaxo, leaving him broke. He was forced to stay on his friends’ couches. Thankfully, 24-year-old Parker met 22-year-old Mark Zuckerberg six months after Facebook launched. The rest, as they say, is history. Fun Fact: When Amazon was founded in 1994, Bezos paid himself a salary of $60,000. Since then his total annual pay has risen to $1.68 million. But only $81,840 goes to his salary. The other $1.6 million covers his security detail. How he did it: Bezos left his high-paying gig at a New York investment firm to start Amazon. He was 31-years-old and had the help of $300,000 from his parents. Amazon, initially just a book-selling site, had sales of $20,000 two months after launch. Amazon went public three years later, which soon made Bezos a billionaire. His parents’ investment is now worth close to $12 billion, giving Bezos the right to drink his coffee out of a “World’s Greatest Son” and have it be true (arguably his greatest accomplishment). Fun Fact: In 2012, when he was already the 40th richest person in the world, Zuckerberg took out a $6 million loan to buy his house because he negotiated an interest rate of 1%. With inflation at around 3%, this meant he borrowed the money for free. How he did it: Facebook launched in 2004 at Harvard, and had 1,500 users in its first 24 hours. Within seven months Zuckerberg left Harvard, moved the company to Palo Alto, and raised $500,000 in funding. In 2006, Zuckerberg turned down an acquisition offer of $1 billion by Yahoo. Fun Fact: The most expensive item ever sold on eBay was a $168 million yacht. How he did it: Omidyar created the first version of eBay as a side project in 1995 when he was 28-years-old. Within nine months the site was making enough money for Omidyar to quit his job. In year three, eBay went public, making Omidyar an instant billionaire. Fun Fact: Groupon was originally called The Point and was inspired by Malcolm Gladwell’s book, The Tipping Point. How he did it: Everyone knows what Groupon is, but most people don’t realize that it’s the fastest-growing company ever. Groupon landed a billion dollar valuation after raising $135 million only 17 months after launching. Additionally, according to Forbes, it took Groupon seven months to become profitable and only 2.5 years to do over a billion dollars in revenue. Of course, I’d be withholding information if I didn’t let you know that Groupon isn’t doing so hot nowadays. Fun fact: While Winnick lost most of his wealth in the telecom crash, he still owns a $225 million mansion in Los Angeles, which has a replica of the Oval Office. When it was for up sale in 2013, the house was considered the most expensive home in America. How he did it: In 1997 Winnick created Global Crossing, which laid fiber optic cables across the Atlantic Ocean. AT&T, Microsoft, and other corporations used Global Crossing’s cables to access their Asian customers. A year later Global Cross went public, making Winnick a billionaire in 18 months; one of the few winners of the dot-com bubble. Four years later Global Crossing filed for bankruptcy and was accused of fraud. This resulted in having to pay $335 million to shareholders. If it looks too good to be true, it is. Fun fact: After making his billions, Walker started collecting books. He now has one of the most impressive libraries in the world. How he did it: Prior to founding Priceline, Walker was the founder of Synapse Group, a finance startup that was acquired for $300 million. Walker started Priceline using the funds from the Synapse sale. Priceline launched in 1998 and sold 40,000 tickets within four months of launching. In 1999 the company went public, making Walker a billionaire. Walker did the business equivalent of dropping the mic as he left the company in 2000. Talk about a fast ride. Want more goodies like this? Here are 10 entrepreneurs who were nobodies until their 30s.